Since the beginning of time, God has been shedding light on the world. Genesis starts dark and void but God said, “Let there be light”. The New Testament starts with God sending a Light into the world. The world was dark and in need of the Light, so God sent Him. We are made in the image of the Light and thus we are the light of the world. This morning at worship I was blessed by singing one of my favorite songs. I turned it into a prayer as I often do. The song brought so much truth and Scripture to mind I couldn’t help but be moved to write devotionals pertaining to the song. I hope you will be blessed by this Cliff Richard song. God’s Word says it so well. 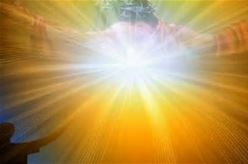 I will close here with — Jesus is the light of the world who rescued us from the domain of darkness, set us free to stand firm on His life because He is the way and truth. God bless you as you allow Him to shine on you.